Air-India 1960 - 1970 Boeing 707 Era. The Boeing 707-437 aircraft with Rolls Royce engines was first used on this flight. VT-DJJ (VT-DVA?) Annapurna was the aircraft used. This aircraft crashed at Bombay on 22 June 1982. The cover bears the autographs of Capt. Byramjee and Capt. K.R. Gazder. 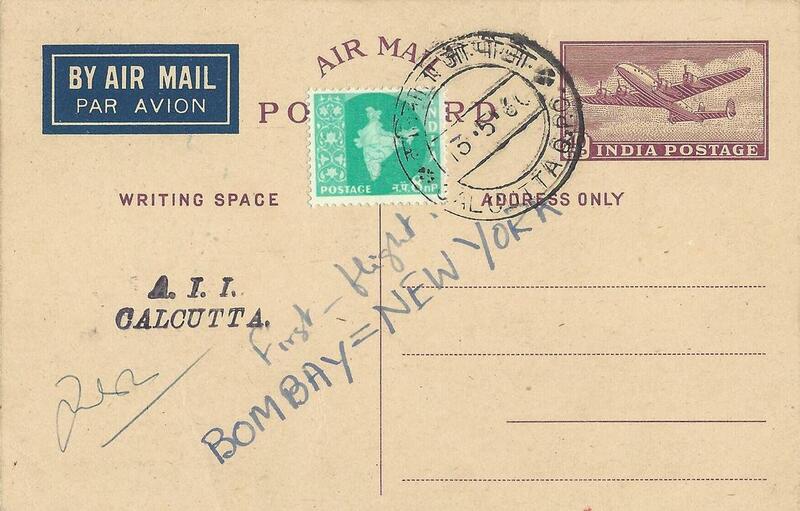 Cover flown from Bombay to London on the inaugural Boeing 707 service, Franked with 33p Book Post rate. The air mail label printed on the cover has a unified map of India, Pakistan and Burma, Notwithstanding the face that Burma was separated in 1937, and Pakistan in 1947. Air Mail cover with violet boxed rectengular cachet for the Boeing 707 flight on the Rome - Bombay stage flown on 21 April 1960. Official Air-India stationary printed souvenir cover with violet boxed rectengular cachet for the First Boeing 707 Flight on the Rome - Bombay stage flown on 21 April 1960. The Bombay - London service was extended to New York once a week. Air-India souvenir cover with Air-India purple commemoration rubber stamp and Bombay G.P.O. date cancellation stamp. Air Mail postcard tied with Calcutta cancellation dated 13-5-60 and hand stamped in dark blue A.I.I CALCUTTA, and written by hand First Flight, Bombay = New York. 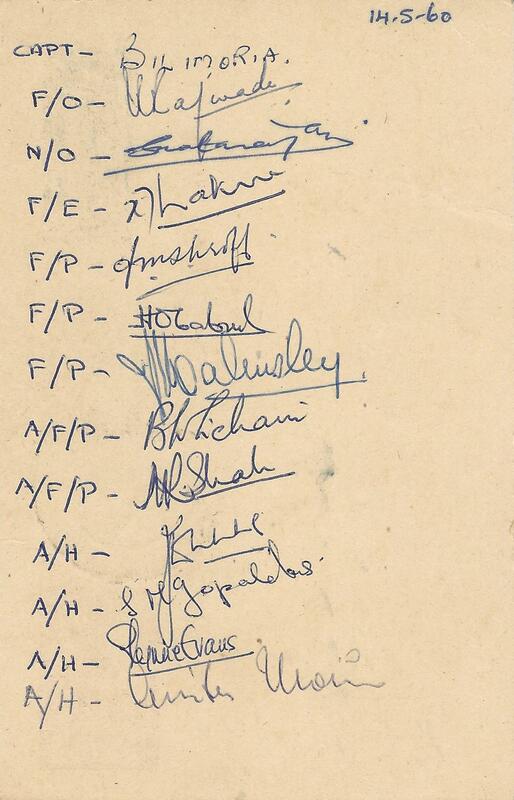 On the reverse is the date 14-5-60, and list of flight crew designations, and all their signatures. The cover flown from Bombay to London route, extended to New York. Commercial Air Mail cover tied with Bombay cancellation dated 14-5-60 and hand stamped with dark blue overfirst flight cachet, addressed to Benicia, California, U.S.A., with additional franking on reverse. Rare to see commercial mail on this flight. Cover flown from Bombay to London on the inaugural Boeing 707 service to New York. Franked with 33p Book Post rate. The Air Mail label printed on the cover has a unified map of India, Pakistan and Burma, notwithstanding the face that Burma was separated in1937, and Pakistan in1947. Air Letter (Aerogramme) cover with U.S. Mail mark dated 14 May 1960 and Light Blue Air-India flight commemoration cachet on front, and Bombay Airport receiving stamp dated 16.5.1960 on the reverse. Post Card with United Nations Cancellation mark dated 14 May 1960 and green Air India flight commemoration stamp on front, and Bombay Airport receiving stamp dated 16.5.60 on the front. Cover with Idelwild Airport, N.Y. cancellation mark and purple Air-India flight commemoration stamp on front, and Bombay Airport receiving stamp dated 16.5.60 on the reverse. Air Mail cover with United Nations Cancellation mark dated 14 May 1960 and green Air-India flight commemoration stamp on front, and Bombay Airport receiving stamp dated 16.5.60 on the reverse. Cover with green rectengular boxed return flight cachet, and five different U.N. Postage stamps and addressed to Denmark. The reverse has the Bombay Airport arrival mark. Air Letter (Aerogramme) cover twith United Nations cancellation mark dated 14 May 1960 and green Air-India flight commemoration stamp on front, and Bombay Airport receiving stamp dated 16.5.60 on the reverse. This souvenir card was inserted inside the commemorative Air-India cover issued for the Flight on the Bombay - New York sector with the introduction of Rome as a halt for the first time. This is the commemorative Air-India cover issued for the flight on Bombay-New York sector with the introduction of Rome as a halt for the first time. The Bombay - New York service via Cairo, Rome, Frankfurt and London was extended to start from Calcutta. ​ Air Mail cover with Air-India purple commemoration rubber stamp and CALCUTTA FOREIGN POST date cancellation stamp of 9 June 1960. This cover was flown on Calcutta - New York route. ​ Air Mail cover with Air-India purple commemoration rubber stamp and Calcutta Foreign post date cancellation stamp of 9 June 1960. This cover flown Calcutta - Rome arrival stamp on reverse dated 10 VI 1960. ​ Air Mail cover with Air-India purple commemoration rubber stamp and Calcutta Foreign post date cancellation stamp of 9 June 1960. This cover was flown on the Calcutta - Frankfurt stage. ​ Air Mail cover with Air-India purple commemoration rubber stamp and CALCUTTA FOREIGN POST date cancellation stamp of 9 June 1960. This cover flown on Calcutta - London stage. ​ Double Print Airmail cover with Air-India purple commemoration rubber stamp and CALCUTTA FOREIGN POST date cancellation stamp of 9 June 1960. This cover flown on Calcutta - London stage. ​ Air Mail cover with Air-India purple commemoration rubber stamp and CALCUTTA FOREIGN POST date cancellation stamp of 9 June 1960. This cover flown on Calcutta - New York Stage. Registered Cover with Geneva Registration Label No 707 dated 2 VII 60 and Bombay Airport receiving stamp dated 7.7.60 on the reverse. Also on reverse a Bombay Custom House Postal Appraising Section hand stamp 'Passed'. 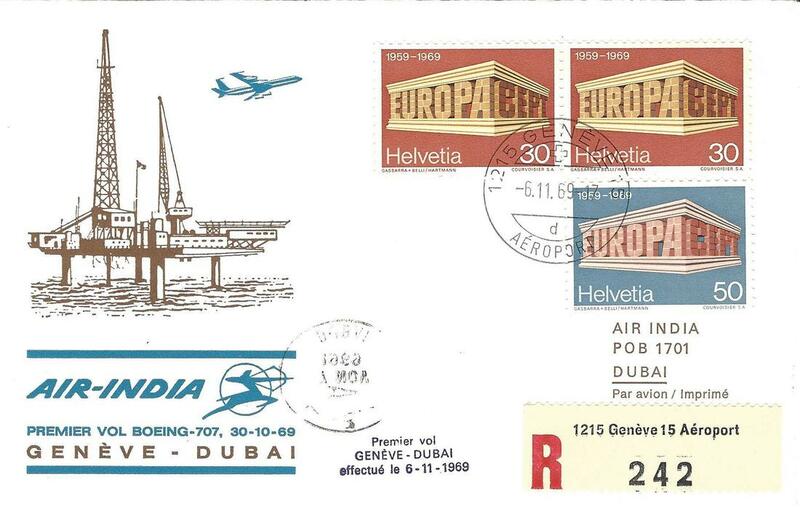 ​ Cover produced by Philatelistenclub Swissair, Zurich. First Boeing 707 Flight on Tokyo - Bombay route. The weekly Tokyo - Bombay Boeing 707 service was introduced. Souvenir Air-India cover with purple Air-India commemoration handstamp, and Tokyo cancellation stamp dated 16.1.61. ​Airport Bombay arrival stamp dated 17-1-61 on the reverse. Air Mail cover with Air-India sticker and Tokyo cancellation stamp dated 16.1.61. Airport Bombay arrival stamp dated 17-1-61 on the reverse. The cover was then flown onward to Karachi and delivered on 21 January. First Boeing 707 Flight on Tokyo - Bombay on 16 January 1961. First Boeing 707 Flight on Bombay - Tokyo Sector. Air Mail cover flown from Bombay to Calcutta on the inaugural Boein 707 service of Air-India to Tokyo. Post marked Bombay G.P.O. 25 Jan 1961. and with the special Air-India first flight cachet. Air Mail cover flown from Bombay tp Hong Kong on the inaugural Boeing 707 service of Air-India to Tokyo. Postmarked Bombay G.P.O. 25 Jan 61, and with the special Air-India first flight cachet. Air Mail cover flown from Bombay to Tokyo on the inaugural Boeing 707 service of Air-India to Tokyo. Postmarked Bombay G.P.O. 25 Jan 1961, and with the special Air-India first flight cachet. The weekly Bombay - Tokyo Boeing 707 service was introduced. 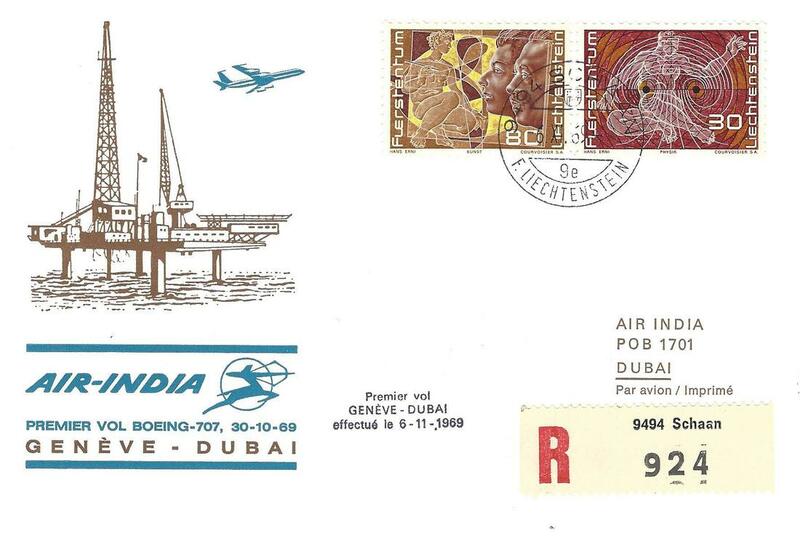 Souvenir Air-India cover with purple Air-India commemoration handstamp, and Bombay G.P.O. cancellation stamp dated 15.Jan.61. Tokyo AP arrival stamp dated 25-1-61 on the reverse. First Boeing 707 Flight on Bombay - Tokyo on 25 January 1961. Airmail postcard with Indian Pjilatelic Bureau, Calcutta 25.1.61 cancellation, and rectangular Air-India hand stamp. also, on reverse Hong Kong receiving stamp of 26-1-1961. There is a special stamp Agricultural Show 4th - 5th Feb.
Airmail postcard with Indian Philatelic Bureau, Calcutta 25.1.61 cancellation, and rectangular Air-India hand stamp. On 3 May 1961, Zurich was discontinued as a scheduled halt on the U.K. route. Rome was introduced as a halt instead. This cover was flown on the return non-stop flight from Rome to Bombay on 4 May 1961. AI 108 on the Prague - Bombay stage. On the London - Bombay route. Vienna was introduced as a halt on the Bombay - London route. This cover was flown on the return flight from Vienna to Bombay via Rome on 23 May 1961. An unusual Air-India first flight cover. A specially printed cover for the Air-India first flight Vienna - Bombay on 23 May 1961 appears to have been flown first on a balloon flight on 16 May, 1961. It was then flown to Bombay on the AI FF. The covers have 2 additional cachets, LupostaWien 101, and Ersttag. Original photo - The Goodwill Youth Mission from Japan comprising of theree boys and girls, all teenagers, arrived in Bombay by Air-India. The Goodwill Youth Mission from Japan. Boeing 707s were introduced on the Sydney route with the service operating via Bangkok instead of via Madras. Withdrawal of Super Constellation from scheduled operations. The cover bears the autograph of Capt. S F Pedder. ​Withdrawal of Super Constellation from scheduled operations. ​Withdrawal of Super Constellations from scheduled operations. This cover was flown on the return flight. The postcard was flown from India to Germany especially for the Leipzig autumn fair, 1962. The front side of the cover bears the cachet SONDERFLUGVERKEHR LEIPZIGER HERBSTMESSE 1962. Postmarked DELHI G.P.O. - 6, 1-9-62. Perth was introduced on the Sydney route as a scheduled halt instead of Darwin which was a technical halt. This cover is postmarked 17 October 62, which is 2 weeks after the date of the first flight. Intresting postal marks of the front and reverse of the cover. Unlikely to have been flown on the first flight. ​This cover was flown on the return flight. This is the commemorative Air-India cover issued for the direct flight on 1 April 1963. The Sydney route was extended to Nandi (Fiji) on 3 August 1964. 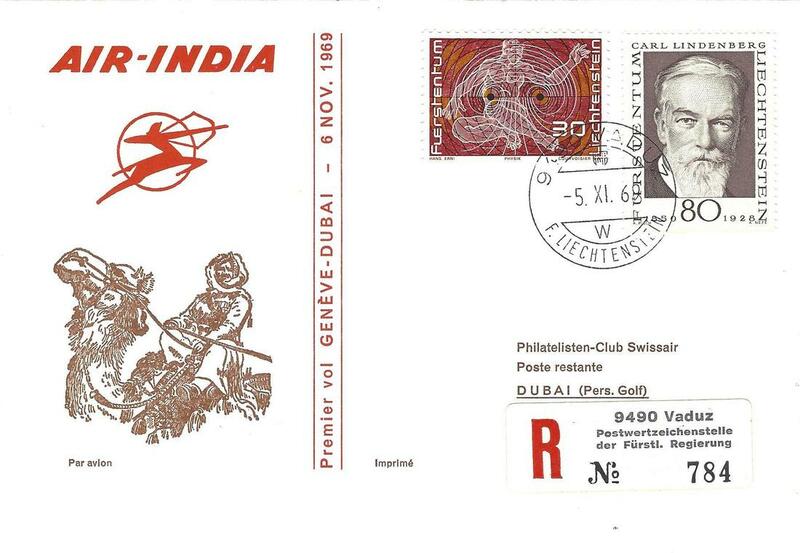 This is the commemorative Air-India cover issued for this flight. First Boeing 707 Flight of Sydney - Bombay route extension to Nandi (Fiji). Return Flight on 5 August 1964. This is a commemorative Air-India cover issued for this flight flown on the return flight on 5 August 1965. 38th International Eucharistic Congress, Bombay. Cover dated 28 November 1964. The cover was issued in advance of the visit of H.H. 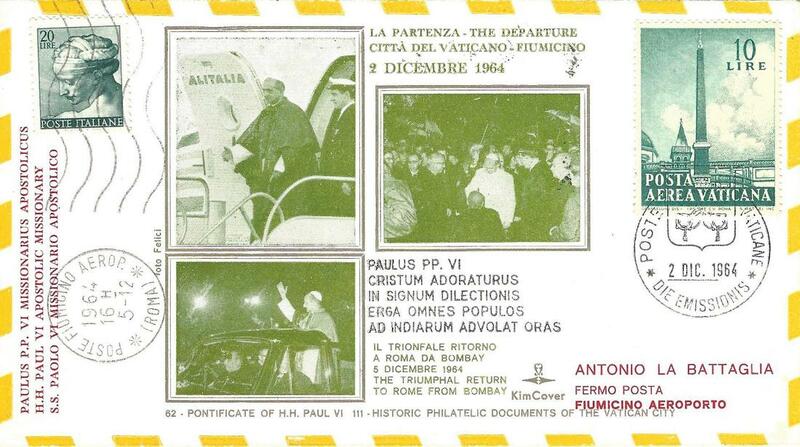 Pope Paul VI and was flown by Air Mail Second Class from Bombay to the Vatican City on 28th November 1964. The cover is postmarked Bombay G.P.O. 28.Nov.64 and bears the arrival postmark Poste Roma A.D., 30 XI 1964, Upon arrival at the Vatican this cover was franked by a Vatican Post L.15 postage stamp and tied with circular cancellation mark, Citta Del Vaticano 30.11.64. Posta Aerea. It has a picture of the Pope addressing the crowd in Bombay. Special flight on 2 December 1964. Pope Paul VI visited Bombay on a special Air-India flight. This is the commemorative Air-India cover issued for this flight flown on 2 December 1964 franked with Vatican Cisty Stamps issued specially for this occasion showing various scenes of Bombay. This cover was flown on 2 December 1964 franked with Vatican Cisty Stamps and cancellation mark Poste Vaticane. Cover dated 2 December 1964 flown on the special Air-India flight. This cover was flown from Vatican City, Fiumicino Airport, Rome, Italy. The cover is franked with Vatican Post Stamps​, some of which were issued specially to commemorate the visit to India, and postmarked Poste Vaticane 2 Dic 1964 Emissions. There is also a special cancellation which reads Paulus Pp. Vi/Cristum Adorations/ In Signum Dilectionis/ Erga Omnes Populos/ Ad Indiarum Advolat Oras, and a rectangular cachet Dispaccio Aereo Speciale Citta'del Vaticano - Bombay. 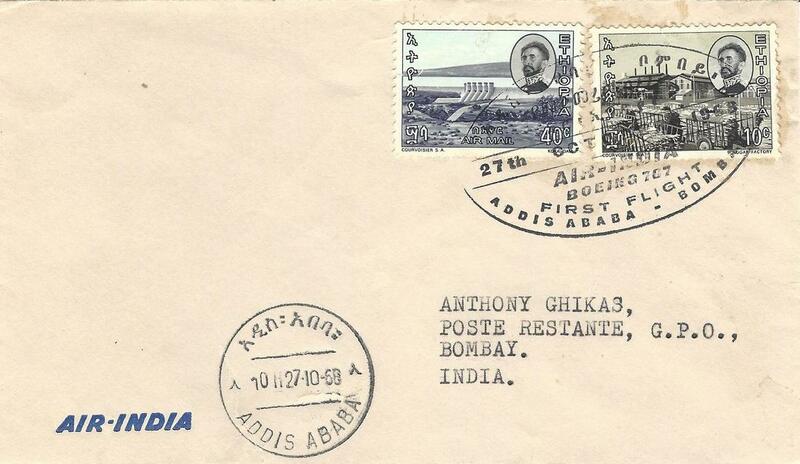 On the reverse is an delivery stamp, Bombay, Dely 4 Dec 64, and Citia Del Vaticano - 5.12.64 - 19 Posta Aerea. The cover was issued to commemorate the arrival of H.H. Pope Paul VI at the Int. Eucharistic Congress in Mumbai. The cover is franked with 2x15p Indian postage stamps, tied with postmarked 2-12-64, Bombay G.P.O. and additionally franked with Poste Vatican L.15 postage stamp, with postmark Citta Del Vaticano 2.12.64. Posta Aerea. It was flown as second class by Airmail. The cover has the picture of Pope arrving amidst the crowd in an open car. This cover was flown from Vatican City, Fiumicino Airport, Rome, Italy. The cover is franked with Vatican Post stamps, some of which were issued specially to commemorate teh visit to India, and Postmarked Poste vaticane 2 Dic 1964 Die Emissions. Limited edition, one of only 100 printed. Cover flown on the special Air-India flight, and return Alitalia flight. This cover was flown Vatican City to Bombay postmarked Poste Vaticane Die Emissions 2 Dic. 1964. It bears the cachet Paulus Pp. Vi/ Cristum Adorations/ In Signum Dilections/ Erga Omnes Populas/ Ad Indiarum Advolat Oras. This cover was flown back to Vatican City on the return of H.H. Pope Paul VI. An has another Italy post L.20 postage stamp tied with date cancellation Poste Fiumicino Aerop, Roma, 5-12-1964. On the verso, it bears the arrival postmark Roma Fiucimino Aeroporto 2.12.65. 15 Arrivi. Cover dated 3 December 1964. The cover was issued to commemorate the arrival of H.H. Pope Paul VI at the Int. Eucharistic Congress in Mumbai. The cover is franked with 2x15p Indian postage stamps, tied with postmarked 3-12-64, Bombay G.P.O. and additionally franked with Poste Vatican L.25 postage stamp, with postmark Citta Del Vaticano 3.12.64. Posta Aerea. It was flown as second class by Airmail. The cover bears the a picture of India President, Dr. S. Radhakrishnan along with H.H. Pope Paul VI, another picture shows the Pope addressing the a group of non-Christians, and the third has the Pope consecrating five bishops from five continents. Cover dated 4 December 1964. The cover was issued to commemorate the arrival of H.H. Pope Paul VI at the Int. Eucharistic Congress in Mumbai. The cover is franked with 2x15p Indian postage stamps, tied with postmarked 4-12-64, Bombay G.P.O. and additionally franked with Poste Vatican L.25 postage stamp, with postmark Citta Del Vaticano 4.12.64. Posta Aerea. It was flown as second class by Airmail. The cover bears the picture of H.H. Pope Paul VI giving message to the World from Bombay. On the verso, the cover bears the message meant for the press in English and Italian. 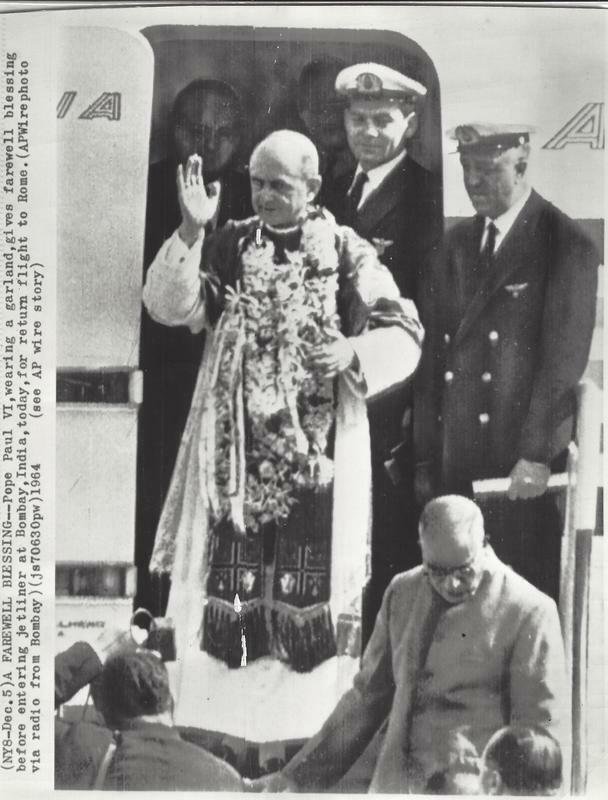 Return of Pope Paul VI from Bombay to Rome by Alitalia Special flight on 5 December 1964.
for a return flight to Rome. The cover issued for the return flight of the H.H. Pope Paul VI from Bombay - Vatican City. The cover flew Second Class and was carried as air mail. The cover franked by 2x15p India postage stamp, and postmarked Bombay G.P.O. 5.Dec.64. Additionally franked with Poste Vatican L.25 postage stamp, cancelled Citia Del Vaticano -5.12.64- 19 Posta Aerea. The Pope is seen in the picture on the cover boarding the special Alitalia flight for his return journey. Souvenir Air-India cover issued for the occasion. Inadequate franking for international air mail, and no receiving mark, so on evidence of to indicate this cover was actually flown. Special cover issued on 23 May 1966 by Air-India. This is a commemorative Air-India cover issued for occasion on postmarked Bombay, 23 May 1966, and additionally franked with an Austrian stamp and special cancellation mark to celebrate the Aerophilately Day on 3 June 1966. Flight on 1 April 1967. This is the commemorative Air-India cover issued for the first flight on 1 April 1967. This is the commemorative Air-India cover issued for the first return flight on 2 April 1967. This is the commemorative Air-India cover issued for the first flight on 5 April 1967. This is the commemorative Air-India cover issued for the first return flight on 5 April 1967. This is the commemorative Air-India cover issued for the first flight on 15 August 1967. This is the commemorative Air-India cover issued for the first return flight on 16 August 1967. This is the commemorative Air-India cover issued for the first flight on 18 August 1967. This is the commemorative Air-India cover issued for the first return flight on 18 August 1967. This is the commemorative Air-India cover issued for the first flight on 27 October 1968. This is the commemorative Air-India cover issued for the first return flight on 27 October, 1968. Flight on 27 October 1968. This is the commemorative Air-India cover issued for the first flight on 29 October, 1968. This is the commemorative Air-India cover issued for the first return flight on 30 October 1968. This is the commemorative Air-India cover issued for the first flight on 31 October,1968. This is the commemorative Air-India cover issued for the first return flight on 31 October, 1968. This is the commemorative Air-India cover issued for the first flight on 2 April 1969. This is the commemorative Air-India cover issued for the first return flight on 2 April 1969. This is the commemorative Air-India cover issued for the first direct flight on 2 April, 1969. Flight on 2 July, 1969. This is the commemorative Air-India cover issued for the first flight on 2 July, 1969. Flight on 5 July, 1969. This is the commemorative Air-India cover issued for the first return flight on 5 July, 1969. Flight on 30 October, 1969. This is the commemorative Air-India cover issued for the first direct flight on 30 October, 1969. Flight on 6 November, 1969. This is the commemorative Air-India cover issued for the first return flight on 6 November, 1969. Franked with Liechtenstein adhesives and cancellation on 6 November. This is the commemorative Air-India cover issued for the first return flight on 6 November, 1969. This is the commemorative Air-India cover issued for the first return flight on 6 November, 1969. Franked with Liechtenstein adhesives and cancellation on 5 November. This is the commemorative Air-India cover issued for the direct return flight on 6 November, 1969. Flight on 1 October, 1970. This is the commemorative Air-India cover issued for the first flight on 1 October, 1970. Flight on 2 October, 1970. This is the commemorative Air-India cover issued for the first return flight on 2 October, 1970. Flight on 3 November, 1970. This is the commemorative Air-India cover issued for the first return flight on 3 November, 1970. ​No postal stamps affixed but with Dhahran Airport Roller Cancellation.